Niger Delta leaders, under the auspices of the Pan-Niger Delta Forum, met with President Muhammadu Buhari on Tuesday and presented a 16-point demand to him. They said the 16 points were where “quick wins” could be achieved to restore hope and confidence in a region that has “grown skeptical of dialogue and engagements that have hardly produced tangible results”. The demands include allocation of oil blocs to natives of the region, maritime university, stop of military occupation of communities and proper funding of the amnesty programme. The demands also include extension of Ogoni clean-up to other areas of the region, employment opportunities for trained ex-militants and support for internally displaced persons in the region. Other demands are relocation of international oil companies that have their head offices in Lekki and other places back to their areas of operations, infrastructural development, manpower and human resources development, federalism, among others. 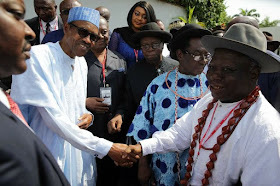 Addressing State House correspondents after the two-hour closed-door meeting with the president, an elder statesman from the region, Chief Edwin Clark said Buhari received them very well. He said they were not at the Presidential Villa for a battle with Buhari, saying the meeting was a combination of all interest groups. The Minister of State for Petroleum Resources, Ibe Kachikwu, said Buhari told the stakeholders that he did not want a quick solution but wanted to dig into what the real problems were.